The region’s community-college presidents, from left, Bob Pura, Ellen Kennedy, John Cook, and Christina Royal. Jeff Hayden had spent more than an hour talking about the critical roles played by community colleges in this region — while also listening to colleagues do the same — and desired to put an exclamation point of sorts on matters with a story about a woman whose case he had come to know first-hand. She was about to earn a certificate of completion in a specific field from Holyoke Community College (HCC), and had a job interview set for the following week. She still had considerable ground to cover in terms of starting and then forging a new career, but she had a new-found confidence and sense of purpose, and wanted to let HCC officials know that — and know why. 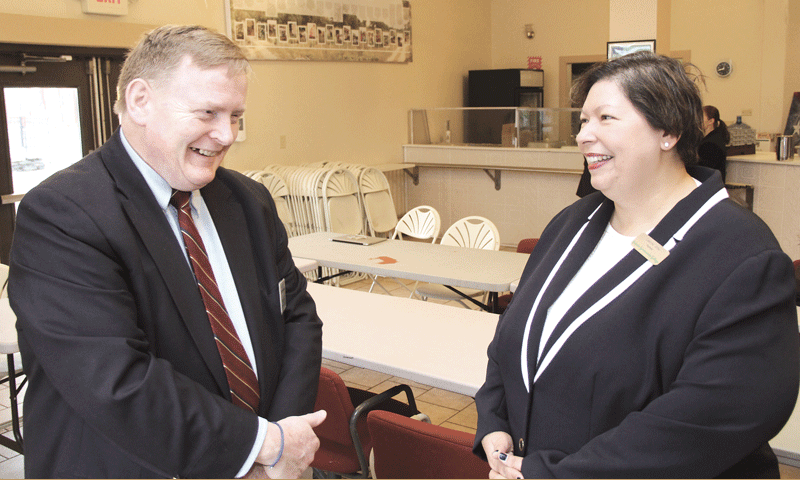 Jeff Hayden, seen here with new HCC President Christina Royal, says community colleges provide a vital pathway to an education, especially for first-generation college students. With that, Hayden effectively and somewhat concisely explained why the four community colleges serving residents of Western Mass. — HCC, Berkshire Community College (BCC), Greenfield Community College (GCC), and Springfield Technical Community College (STCC) — have been chosen collectively as Difference Makers for 2017. Through use of those phrases ‘the power of the four institutions’ and ‘thousands of stories,’ he hit upon the real and profound impact of the four schools, which have been making a difference now for almost 60 years in some cases. Echoing Hayden, Bob Pura, president of GCC, said the community colleges act as both a door of opportunity, especially for those who don’t have many open to them, and a pathway to both careers and four-year degrees at other schools. And GCC is a perfect example. It is the only institution of higher learning in Franklin County, the poorest and most rural in the state, said Pura, while stressing that point about access to an education, and it has one of the highest rates of transfer to four-year schools among the state’s 15 community colleges. By ‘better served,’ Pura meant work beyond the schools’ historic mission of providing potentially life-altering opportunities to their students. Indeed, they are also playing important roles in a host of ongoing economic-development initiatives across Western Mass. 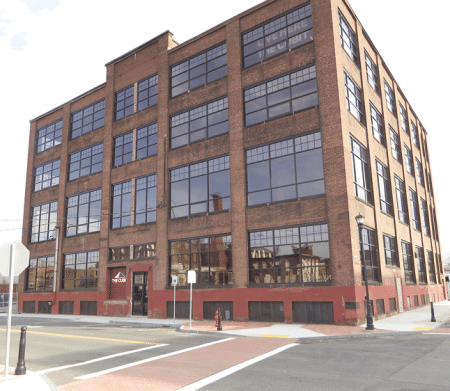 HCC’s involvement in the Cubit building project in downtown Holyoke is just one example of how community colleges have become forces in economic-development efforts. In fact, if one were to name a key issue or specific program, one will likely find one of the community colleges involved with it at one level or another. Start with the region’s workforce. The schools are the proverbial tip of the spear in initiatives ranging from the retraining of manufacturing workers displaced by the decline of that sector to preparing individuals for the myriad jobs in the broad healthcare field that will have to be filled in the years to come; from training area residents for many of the 3,000 or so jobs to be created by the MGM Springfield casino to providing specific help with closing the so-called skills gap now plaguing all sectors of the economy and virtually every business, a problem addressed mostly through a program called TWO, as we’ll see later. 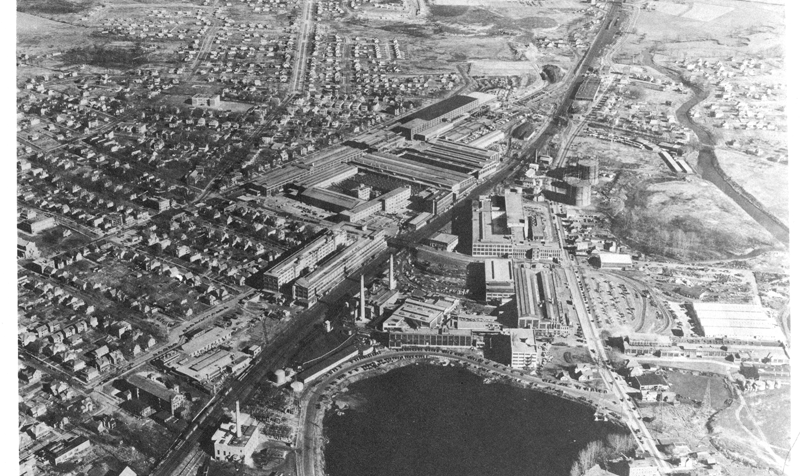 But there are other examples, as well, from STCC’s work to help precision manufacturers build a steady pipeline of talent to BCC’s involvement with efforts to create new opportunities for jobs and vibrancy at the sprawling former General Electric complex in Pittsfield, to HCC’s decision to move its culinary arts program into a mostly vacant former mill building in downtown Holyoke, thus providing the needed anchor for its revitalization. All of these examples and many more help explain why the region’s community colleges — individually, but especially as a group — are true Difference Makers. Community colleges, formerly known in some states as junior colleges, can trace their history back to 1901 (Joliet Junior College in Illinois is generally considered to be the first). There are now nearly 1,200 of them enrolling close to 8 million people. They come in all shapes and sizes, some with just a few hundred students and others with enrollment in the tens of thousands. In the Bay State, community colleges can trace their roots to 1958, when an audit of state needs recommended the establishment of a community-college system to address the need for more diversity and access to higher education in the Commonwealth, which, then as now, has been dominated by a wealth of prestigious (and expensive) private colleges and universities. The recommendation was adopted by the Legislature in August of that year, and the accompanying legislation included formation of the Board of Regional Community Colleges, which established nine of the current 15 schools within a five-year period, starting with BCC in 1960. “We were the first one,” said Ellen Kennedy, president of that Pittsfield-based institution, with a discernable note of pride in her voice, while acknowledging that what is now HCC has a longer history, because that school began as Holyoke Junior College, which opened in 1946. GCC opened its doors in 1962, and STCC, housed in the historic Springfield Armory complex, which was decommissioned in the mid-’60s, opened amid some controversy — HCC is only eight miles away as the crow flies, and many thought there wasn’t a need for two community colleges that close together — in the fall of 1967. Today, community colleges in Massachusetts and across the country face a number of common challenges, including smaller high-school graduating classes, which are impacting enrollment; funding levels that are imperiled by dips in the economy and devastated by serious recessions, such as the one that began nearly a decade ago; and graduation rates that are impacted by the many burdens faced by the community-college constituency — everything from finances to life issues (jobs and family) to even transportation. But overall, community colleges are seeing a surge of sorts. Indeed, amid the soaring costs of a college education and the ever-rising amounts of debt students are being saddled with, the two-year schools are being seen by many as a practical option to at least begin one’s education. Meanwhile, host cities and regions are becoming more cognizant of their ability to help provide solutions to workforce and other economic-development-related issues and problems. This is especially true in Western Mass., where many gateway cities, including Springfield, Holyoke, and Pittsfield, are facing stern challenges as they attempt to reinvent themselves and move on from their collective past as industrial centers, and regions (especially Franklin County) face spiraling unemployment, aging populations, and outmigration of young people. 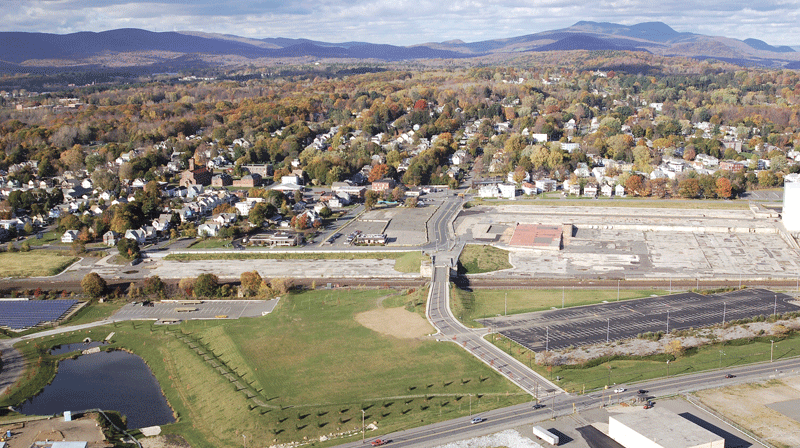 BCC’s efforts to develop new opportunities for the former GE complex in Pittsfield (in its heyday, above, and today) is another example of community colleges becoming involved in economic-development initiatives. But at their very core, community colleges are still all about access — that open door that Pura mentioned. They all have what’s known as open admission, meaning anyone who has a high-school diploma or GED must be admitted. But while getting in isn’t a problem, staying in, and hanging in until a diploma or certificate is earned, can be, and often is. Thus, increasingly, schools have been focusing on that broad, multi-faceted assignment of helping students succeed — with whatever it is they are trying to succeed at. There are many elements that go into this equation, said those we spoke with, from programs focused on basics, including language skills, to new degree and certificate programs to meet specific industry needs, to a host of partnerships with area four-year schools that include not only articulation agreements but efforts to bring those schools’ programs onto the community-college campuses to help those facing time and transportation issues. Meeting this role, this mission, makes the community colleges unique in the pantheon of higher education, and even public higher education. It is a niche, if you will, or, for many, including those we spoke with, a career path they’ve chosen for any of several reasons, but often because they can relate to the students in their charge. Such is the case with Christina Royal, the recently named president of HCC, who is so new to the role she chose to let others, like Hayden, speak about the school’s history and specific current projects while she got fully up to speed. But in a candid interview with BusinessWest upon her arrival, she said that, when she went to Marist College, a private liberal-arts school in Poughkeepsie, N.Y., she was the first in her family to attend college, and it was a struggle for the family to send her there. So she understands what community-college students are up against, and chose that constituency, if you will, as the one she wanted to serve. 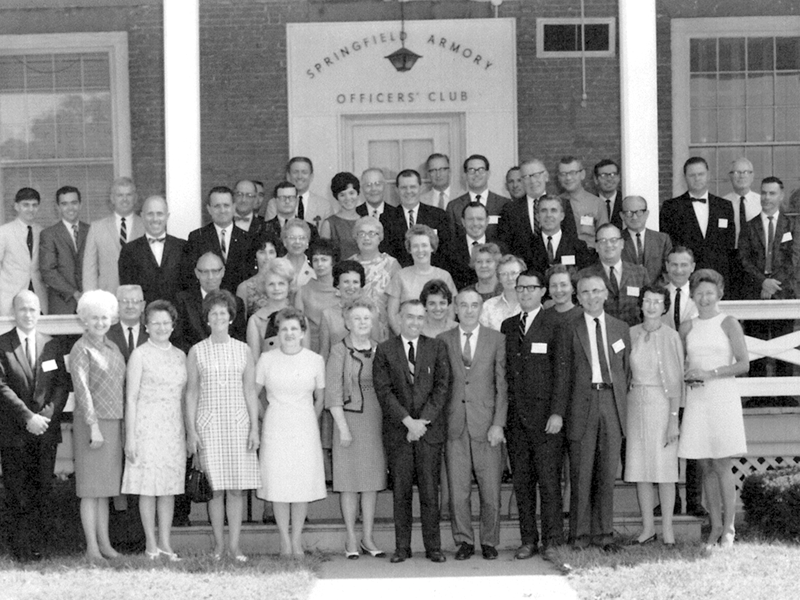 The original faculty and staff at STCC pose in front of the old officers’ quarters at the Springfield Armory. The school was created in 1967 to focus on preparing students for careers in technology-related fields. John Cook, who succeeded Ira Rubenzahl as president of STCC last summer, is similarly attracted to the community-college mission and unique role. Formerly the vice president of Academic Affairs at Manchester (N.H.) Community College, he cast a wide net when seeking opportunities to lead a school, but was specifically focused on community colleges, which, he said, have a direct role in serving their communities (hence that middle name for all these institutions) and their residents, not employers across the country or halfway around the world, as the major private institutions do. Beyond providing access and pathways to opportunities, however, the region’s community colleges have become increasingly larger role players in area workforce and other economic-development-related initiatives. Such roles are natural, said Cook, noting that the schools pride themselves on being nimble, responsive, and, overall, good listeners when it comes to the community — including the business community — expressing specific concerns and needs. 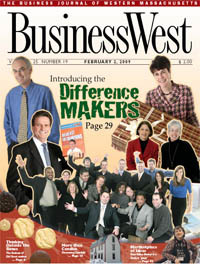 And while such programs solve problems for businesses, the communities they’re based in, and the region as a whole, said Bill Fogarty, HCC’s vice president for Administration and Finance, who served as interim president until Royal arrived, they also benefit individuals who may or may not have a job, but instead need a career. Examples of economic-development-related initiatives that are also creating opportunities for individuals abound, and we’ll start with BCC, which has been active in efforts to help that region move past the huge shadow left by GE and other elements of a manufacturing-based economy, said Bill Mulholland. He recently retired after a lengthy career at BCC, most recently as vice president of Community Education and Workforce Development, a title that speaks volumes about the work he was involved with in recent years. And as he started talking about that work, he referenced a Berkshire Eagle headline — “High-paying Jobs Going Unfilled” — from January 1998. Upon reading it, he called Pura and invited him to lunch, at which there was broad discussion that eventually led to creation of something called the Berkshire Applied Technology Council. That’s where organizers started with a program that would be called (here comes that word again) Pathways, he went on, adding that the initiative effectively checks many of the boxes community colleges are trying to check, including direct involvement with businesses, providing individuals with the basic skills needed to contend for jobs and careers, working in collaboration with other community colleges and other partners, and creating progress with efforts to keep young people from migrating out of the region. Another very specific example is the college’s involvement in the work to create an advanced manufacturing facility (the Berkshire Innovation Center) that will become the centerpiece of the William Stanley Business Park, created on the former GE site. Specifically, the school is developing training programs for individuals that will be employed by companies based there. Human capital, and creating more of it, is at the heart of many BCC initiatives, he went on, adding that the school is also involved with efforts to bolster the creative economy that is becoming a force across Berkshire County and especially a revitalized Pittsfield, as well as the tourism industry that has always been a pillar. As examples, he cited a filmmaking course designed to help provide trained individuals for the many film companies and special-effects houses that now call that region home, and also a special customer-service course for those seeking to enter the hospitality industry. Meanwhile, at GCC, manufacturing is also a prime focus, said Pura, adding that the region has lost a number of large employers in this sector over the past several decades and is intent on both retaining the companies that remain and attracting new ones. To this end, a manufacturing collaborative was formed involving the college, employers such as Yankee Candle and Valley Steel Stamp, the Regional Employment Board, career centers, and area high school. “What became clear was that we needed to invest in our infrastructure; facilities were very antiquated,” said Alyce Stile, dean of Workforce Development and Community Education (same title as Mulholland) at GCC, adding that, with $250,000 in seed money from many of the employers and grant money attained as a result of that investment, Franklin County Technical School has been transformed into a state-of-the-art facility. With that foundation, GCC was able to start its first adult-education evening program — one firmly focused on the basics — with the help of considerable feedback from STCC, BCC, and other partners. No, the region’s community college presidents have not been reassigned. They’re merely using some artistic license to display a pattern of cooperation and collaboration that is only growing. To date, more than 100 students have gone through the program, said Stiles, with the even better news being an employment rate of more than 80%. Other recent initiatives have included a nursing ladder program designed to put more individuals in that important pipeline, and also a comprehensive study of just what area employees want and need from the workers of today and tomorrow. The results were not exactly surprising, but they were enlightening. “Employers made it clear that what’s needed are the communication skills, the ability to critically think through and problem-solve in an innovative way, and the ability to work well with other people,” he explained, adding that a panel comprised of area employers ranging from Herrell’s Ice Cream to Baystate Franklin Medical Center recently emphasized these needs and discussed the next critical step — programming to help ensure workers possess these skills. In Hampden County, meanwhile, initiatives involving the two community colleges there have generated considerably more press, and, like those in the other regions, have involved high levels of collaboration between the schools and a wide variety of other partners. At the top of the list, perhaps, is TWO (Training and Workforce Options), a joint effort between STCC and HCC that provides custom contract training for area businesses and industry-sector collaborations. To date, TWO has created training programs for call centers and customer-service workers, manufacturing production technicians, hospitality and culinary positions, home-health-aide workers, and healthcare-sector employees who need to become versed in the recently introduced medical coding system known as ICD-10, among others. Another collaborative effort, this one involving all the community colleges, is the Mass. Casino Careers Training Institute, which, as that name suggests, is designed to help area residents become qualified for many of the positions that MGM Springfield — or any of the other casinos to open in the Commonwealth — will need to fill. Other specific examples range from STCC’s involvement with CRRC, the Chinese company that will soon be building subway cars in Springfield’s East End, to secure a trained workforce, to HCC’s investment in Holyoke’s Innovation District through the Cubit project. 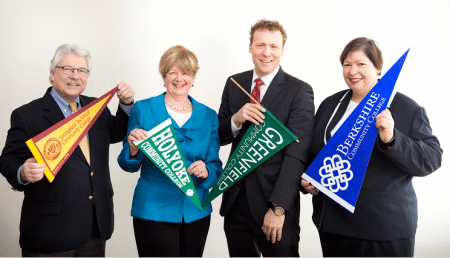 As the presidents of the region’s four community colleges posed for some photographs for this piece, they each gathered up their respective school’s pennant, in a colorful, pride-nurturing exercise in effective identification. Then, as a bit of fun, Pura had them shuffle the deck, if you will. This drill yielded some laughs and intriguing facial expressions, but also some symbolism if one chooses to look for it and accept it. Indeed, while the schools remain immensely proud of their histories and track records for excellence, and do compete on a number of levels — for students, in some cases, and on all sorts of playing fields, especially — they also collaborate, and in ways that are often changing the local landscape. It wasn’t always this way, especially when it came to HCC and STCC, mostly because of their proximity to one another and often-overlapping programs. But this spirit is certainly in evidence now, and the obvious reason is that the schools have realized that they can do more for the region by working together than by trying to do it alone, often with parallel initiatives. Maybe the best example of both sides of this equation is the TWO program. Prior to its formation, the schools went about trying to forge skills-gap solutions themselves, and would often “bump into each other,” as he put it. The effectiveness of that particular collaboration caught the attention of the Boston Foundation, which awarded the two schools the inaugural Deval Patrick Award for Community Colleges in 2015 (it came with a $50,000 unrestricted grant that they split), and in many ways it serves as an example of what other schools can do together — if they are so inclined. The Mass. Casino Careers Training Institute, which will train workers for MGM Springfield (see here in this rendering) and other casinos, is another workforce initiative involving the region’s community colleges. “In the Boston market, they’re still really trying to figure out how to put such partnerships in place,” Hayden went on. “We talk about how we’re eight miles away from STCC or 21 miles away from Greenfield or 58 miles or whatever it is from Berkshire, but in Boston, you have four community colleges that could almost throw rocks at one another, and they can learn from this. There are countless other examples of this mindset, said Mulholland, who cited BCC’s addition of a medical-coding program. Such partnering continues on many levels, and the schools are constantly looking for new ways to forge collaborations, said Cook, adding that he was calling and texting Royal within days of her arrival on Jan. 9 to initiate such discussions and continue a legacy of cooperation that has been handed down to the two of them. Hayden said he doesn’t make a habit of it, but once in a while he will allow himself to think about what it would be like if HCC did not exist in that city. Pura agreed, and to further the point, he summoned a comment he attributes to Allen Davis, former director of GCC’s foundation, and one he relates often. The community colleges have instead made it their mission to provide inroads to better lives. And their success with that mission makes them more than worthy of the title of Difference Maker.